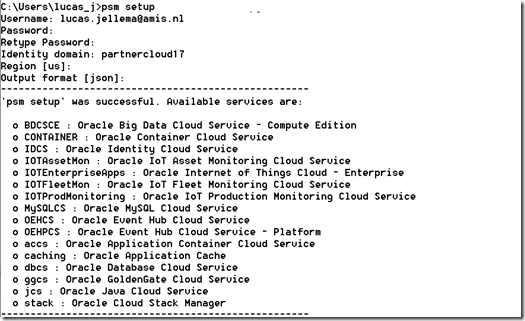 Oracle PaaS Service Manager (PSM) provides a command line interface (CLI) with which you can manage the lifecycle of various services in Oracle Public Cloud. This opens the door for scripting (recurring) tasks – such as (re)deployment of applications on ACCS to provisioning new environments. 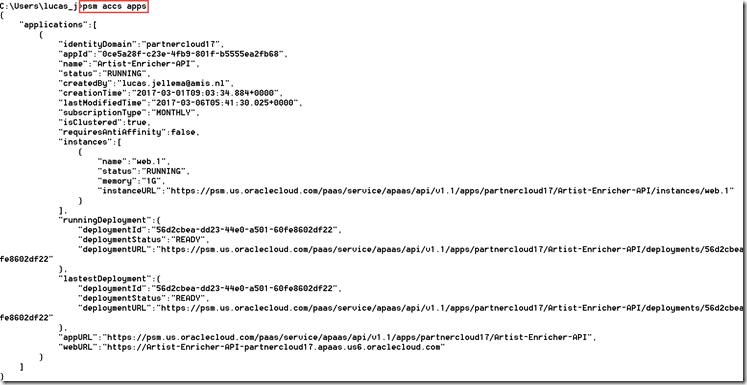 PSM makes performing admin operations on the Oracle Public Cloud a lot easier and efficient, compared to using the the GUI. Note that the CLI is a thin wrapper over PaaS REST APIs that invokes these APIs to support common PaaS features. The steps for installing and configuring PSM are simple enough – and take about 6 minutes. I will briefly walk you through them. They are also documented just fine. Before I continue, I want to thank Abhijit Ramchandra Jere of Oracle for graciously helping me out with PSM. PSM is a Python based tool. To set it up and run it, you need to have Python set up on your machine. 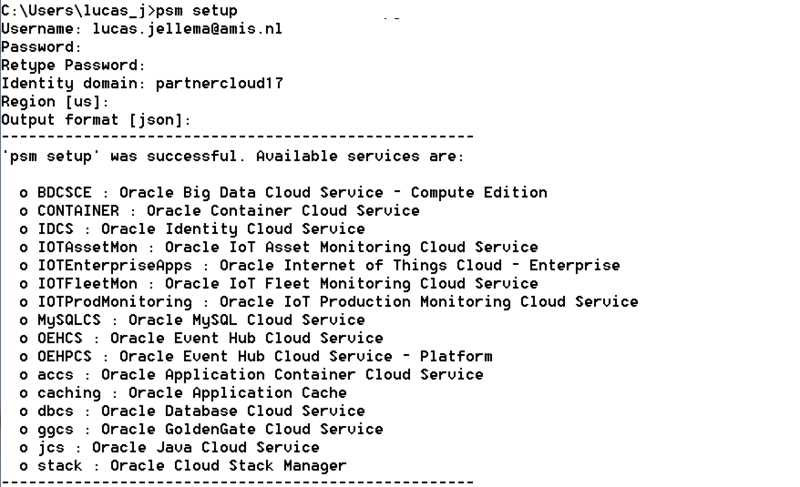 Run the setup for PSM and configure it for use with your identity domain (see docs). Note: this step assumes that the Python scripts directory that contains PSM is in the PATH environment variable. I am not sure if and how you can use PSM on your machine for multiple identity domains or user accounts. 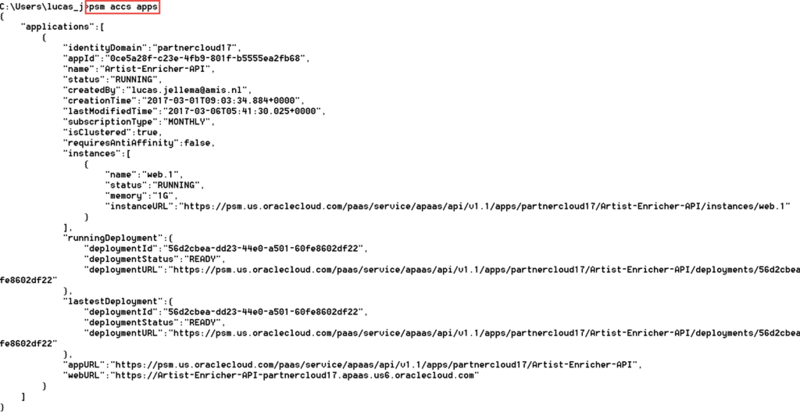 I have access to several Oracle Public Cloud identity domains – even in different data centers. I have now setup PSM for one of them. If I can do a setup for a second identity domain and then somehow be able to switch between the two is not yet clear to me. EDIT: switching to a different identity domain is simply done by running psm setup again. I need to provide the identity domain, region and credentials to make the switch. Note: psm remembers the set up across restart of the operating system. PSM can be used with many PaaS Services – not yet all – for inspecting their health, stopping and (re)starting, scaling and performing many administrative activities. See docs for all of them. and wait for maybe 15 seconds. I ran into an issue, caused as it turned out by having multiple Python versions on my machine. PSM got installed as Python package with version 3.5 and I was trying to run PSM with Python 3.6 as first version in my PATH environment variable. Clearly, that failed. The solution: I removed all but one Python version (3.5 because with 3.6 the installation did not go well because of missing pip) and then installed with that one version.